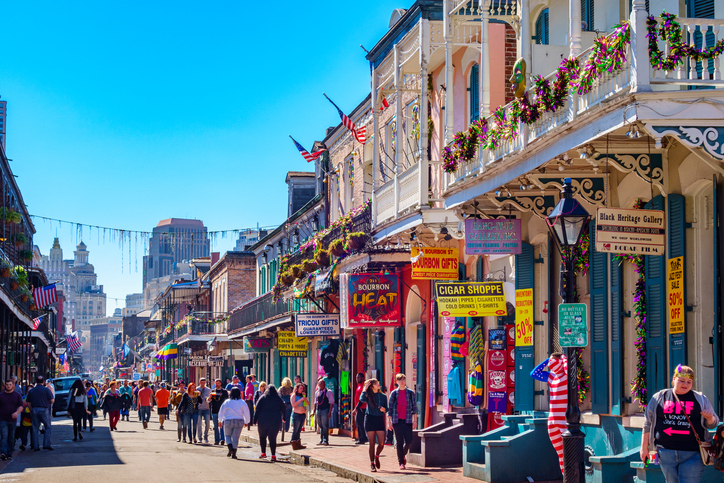 The mesmerising sights, sounds and tastes of New Orleans all go to make it one of the USA’s most popular cities. Jazz enthusiasts are sure to have this, the birthplace of jazz, high on their wish lists, while foodies can’t resist sinking their teeth into po-boys, jambalaya or gumbo. Meanwhile, the sights of the French Quarter, the museums and the Mardi Gras tradition demonstrate the wonders of New Orleans past and present. The focal point is Jackson Square, arguably the best place to start your discovery of the stunning old quarter of New Orleans. Consisting of 98 blocks, this area boasts handsome 18th and 19th century architecture complete with ancient arches and wrought-iron balconies which date back to French and Spanish colonial times. 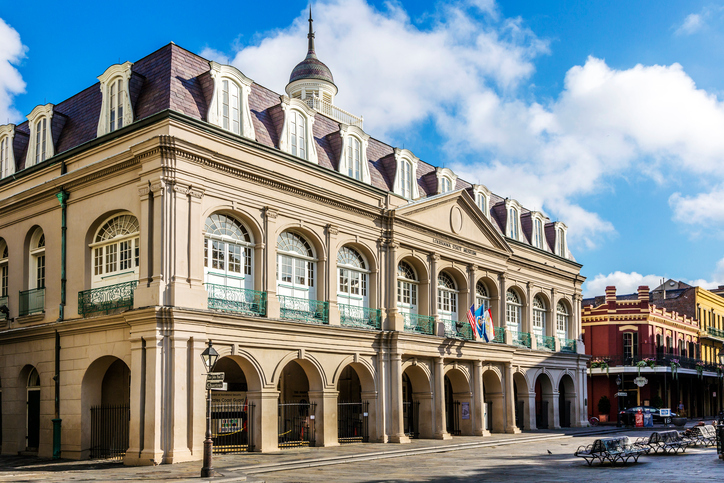 Don’t miss St. Louis Cathedral on Jackson Square; Bourbon Street which caters for those who like to linger over drinks or fine local cuisine; and Royal Street, ideal browsing in art galleries, antique shops and other specialty shops. A must for jazz buffs, the Old US Mint no longer mints money. It houses an excellent collection of music, art and musical instruments, including none other than jazz master Louis Armstrong’s first cornet. New Orleans has several Mardi Gras museums showcasing memorabilia, elaborate, brilliantly coloured costumes, photos and videos in commemoration of the famous Mardi Gras celebrations which take place on Shrove Tuesday each spring. Masks and costumes, dancing, parades and parties fill the streets for a massive carnival extravaganza like no other. If you’re not there for the festivities, the museums will give you a good glimpse of what you’re missing. New Orleans is constantly buzzing with music on the pavements and in the bars. The most famous venue, amid dozens of the city’s jazz clubs, is Preservation Hall, dedicated to old-school, Dixieland New Orleans-style jazz. Even its setting in the French Quarter has preserved the gritty look so befitting of the jazz strains that fill its walls. New Orleans is endlessly devoted to music and festival that celebrates it, and there’s one event in the calendar that always stands out: the annual New Orleans Jazz and Heritage Festival. For over 40 years, music lovers from all over the world have descended on the historic Fair Grounds Race Course to experience a stellar line up of jazz musicians. The event is truly worthy of the birthplace of jazz. New Orleans isn’t only about jazz: you will find a long tradition of heavy metal and punk here too, as well as, R&B and funk. Head to new Orleans’ favourite Siberia, a club devoted to rock and underground music groups which hosts live music nightly as well as burlesque and comedy acts and trivia games. The club is also home to the reputed Kukhnya Slavic Soul Food, which serves up tasty Polish and Russian specialties. To find out what’s on during your stay, you will find listings in the daily newspaper Times-Picayune or in the free monthly publication OffBeat. You’ll need to be hungry for this classic. Jambalaya brings together delicious sausage, vegetables and meats or seafood along with short-grain rice – a bit like a New Orleans-style paella. If it’s a sandwich you’re after, a po-boy won’t leave you hungry. A long, French baguette-style bread is piled high with meat (turkey, beef or smoked sausage) and gravy, or fried seafood (oysters, shrimps or crayfish) and a white tartar-style sauce. Make sure you have it “dressed” as po-boys are best with salad included. A steamy bowl of gumbo is an essential part of your trip to New Orleans. This is a culinary king of stews, made with a delicate mixture of Western European, Caribbean, African and Native American influences. Its rich, dark stock contains meat or fish, bell peppers and onions, and is served over rice. You will find this Creole classic on most menus across the city, particularly on Mondays because it was traditionally made with leftover pork from Sunday dinner and the beans were cooked all day while home keepers did the washing. This dish is often served with a side order of pork chops, sausage or chicken. The New Orleans institution, Antoine’s, first created this sumptuous dish in around 1899. Although the recipe remains a secret, it is essentially oysters on half shells topped with a combination of capers, parsley and parmesan cheese, and topped with a rich white sauce. Bananas, ice cream, dark rum, sugar and spices: if this combination makes your mouth water just thinking about it, head to Brennan’s Restaurant where Bananas Foster was first invented. This flambéed treat is rightfully the restaurant’s most popular dish. Otherwise known as “French doughnuts” these decadent treats are essentially square pieces of dough that, once deep fried, form crispy pillows with soft centres. They are normally covered with fine sugar, but they can also be savoury snacks, filled with shrimp or crawfish.